Set of 4 glasses for cold or hot drinks and 1 carafe drip dree 1 Liter. Can you put your favourite jug in the fridge? Do you have to resort to old fizzy drinks bottles when serving cold water to your guests' The new Eva Solo fridge carafe gives you an attractive alternative to worn-looking plastic bottles. The carafe fits most fridge doors and is available with covers in five stunning colours. The fridge carafe has been designed in a simple, classic milk bottle shape - the size of which fits neatly into the fridge door. 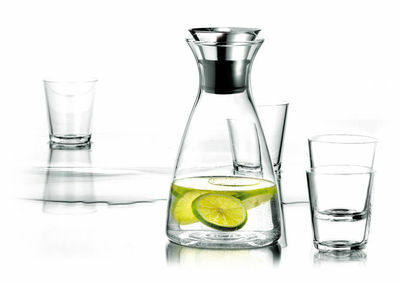 The mouth of the carafe is large enough for ice cubes and sliced lemon, and also features a flip-top lid that opens automatically when you pour. This means that you avoid the fridge aftertaste or ice cubes splashing down into the tumbler. And, of course, there is the added bonus that the carafe is a decorative element on the table.